After picking a ton of Meyer Lemons off the back yard lemon tree I’ve been looking for different ways to incorporate their delicious flavor into some tasty goodies. This recipe for Lemon Almond Biscotti is a perfect way to use the tart fresh flavor of the lemon and add in the nutty crunch goodness of almonds. These biscotti are just perfect with coffee or tea and have a refreshing lemon flavor with a satisfying crisp almond crunch. I added a cup of toasted sliced almonds to the dough and topped the biscotti with a sweet crunchy layer of Swedish pearl sugar. In addition, I added 1/2 teaspoon lemon extract to the dough because I like a stronger lemon flavor. Here is how you can make your own. You can find the basic recipe here. Start by lining a half sheet pan (18″ x 13″) with parchment or Silpat. Set aside. Preheat oven to 350 degrees. If you are using one cup of sliced almonds like I did, toast the sliced almonds and set aside to cool. In the bowl of an electric mixer fitted with the paddle attachment beat together the butter, sugar, salt, lemon zest, almond extract, 1/2 teaspoon lemon extract if using and baking powder. Beat in the eggs and lemon juice until combined. Add the flour and the cooled sliced toasted almonds if using. Mix until a dough comes together. On the prepared baking sheet form the dough into an approximately 14″ x 2 1/2″ log using damp hands and a bench scraper. 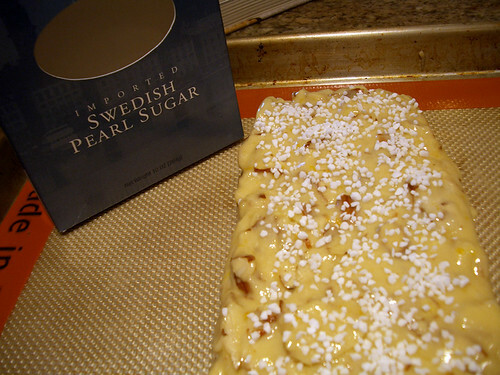 Smooth the top of the log and sprinkle with Swedish pearl sugar if using. Lightly press the pearl sugar into the dough. Bake the dough for 25 minutes. Remove from oven and let cool enough to touch—15-20 minutes. 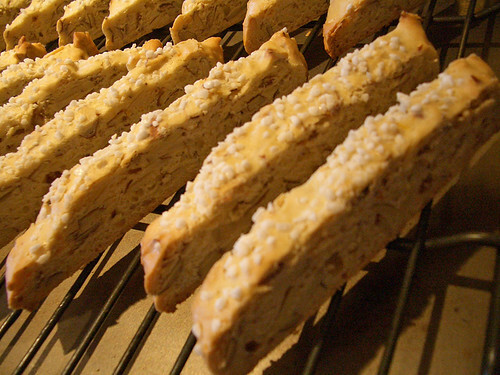 When the biscotti log has cooled, spritz lightly with water to soften the crust for slicing. Turn down the temperature of the oven to 325 degrees. Cut the biscotti and arrange standing up on baking sheet. Return to oven and bake for 30-35 minutes or until dry and golden around the edges. Let biscotti cool completely on a a wire rack before transferring to an air tight container.